Ven. 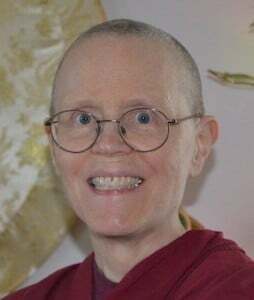 Thubten Tarpa is an American practicing in the Tibetan tradition since 2000 when she took formal refuge. She has lived at Sravasti Abbey under the guidance of Ven. 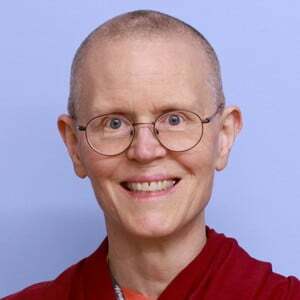 Thubten Chodron since May 2005. The first person to ordain at the Abbey, Ven. Tarpa took her śrāmaṇerikā and śikṣamāṇā ordinations with Ven. Chodron as her preceptor in 2006. See photos. On December 20, 2008 Ven. Tarpa traveled to Hsi Lai Temple in Hacienda Heights California to receive bhikshuni ordination. The temple is affiliated with Taiwan’s Fo Guang Shan Buddhist order. Ven. Tarpa’s other main teachers are the late H.H. Jigdal Dagchen Sakya and H.E. Dagmo Kusho. She has had the good fortune to receive teachings from some of Ven. Chodron’s teachers as well. Before moving to the Abbey, Ven. Tarpa worked as a physical therapist/athletic trainer for 30 years in colleges, hospital clinics, and private practice settings. In this career she had the very rewarding opportunity to help patients and teach students and colleagues. She has B.S. degrees from Michigan State University and the University of Washington and an M.S. degree from the University of Oregon. Among many other Abbey responsibilities, Ven. Tarpa coordinates the Abbey’s building projects.